57 percent of Republicans believe that Obama is a Muslim. 45 percent of Republicans agree with the Birthers in their belief that Obama was not born in the United States and so is not eligible to be president. 38 percent of Republicans say that Obama is doing many of the things that Hitler did. 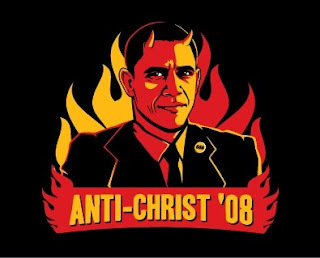 Scariest of all, 24 percent of Republicans say that Obama "may be the Antichrist." The poll, which surveyed 2,230 people right at the height of the health-care reform debate, also clearly shows that education is a barrier to extremism. Respondents without a college education are vastly more likely to believe such claims, while Americans with college degrees or better are less easily duped.